Hal Holubik, owner of Tours D’ Force, a Lenawee County property marketing company challenges themselves to THINK BIG and maybe you should too. How often have you heard the comment “thing big/play big or go home”? Often we don’t allow ourselves to thing big about our business to attract Bigger Clients. But it sounds like a great motivational quote for us right now. So let’s use it for our digital marketing based business. How do you think about your business? First of all, why are we even a questioning that! Shouldn’t we all think big about our businesses? Of course we should! Are we? That’s the question. Well we at Team Tours D’ Force are not going home in fact we’re leveling the playing field. We have shifted our spotlight on how to ‘think big’ by understanding what it means and then we’ll share some of the steps with you on how to be bigger thinkers and create bigger clients in our business. First of all, to ‘think big’ in your virtual tour business doesn’t mean to create bigger programs, bigger product lines or even bigger services. It doesn’t mean charging more, adding more, etc., etc., etc. That is ‘doing’, not thinking. We’re talking about improve our business skills and attracting more clients with less effort. We’re talking about being the go-to person for our clients and potential clients so that they can be more successful. To play harder in your business means to have a deeper meaning in the minds and hearts of your clients. To give them what they truly want and value. So here’s the question, how can we help our clients improve their existing processes and gain greater efficiency, value, and results? Now that’s where we need to go. Instead of your clients doing the same process over and over, how can you help them to improve upon their processes to gain greater yields. I bet you that they would happily invest in that. First – Look at how we might improve our existing processes, products, and services to be more effective, learn how to network to attract leads, use social media to increase our visibility, and speak occasionally to share our expertise, etc. Second – Examine where we can create more efficiency to speed up a good and effective process, teach our prospects and clients how they can get more from what we offer, expand our services and create additional streams of income. Third – Once that ground work has been laid it will be time to share the results with our clients, and explode our presence with workshops and events. Think big about your virtual tour business and gain great returns when you share that information with your clients. To see how you can get more out of your virtual tours and digital marketing efforts, watch; http://www.youtube.com/watch?v=Sx51l90x83c and also stay tuned ‘Pump-UP Your Digital Marketing’ blog, coming soon. Questions or comments can be directed to (517) 486-4209 or email to: Hal@Toursdforce.com. Alamo Area Virtual Tours is dedicated to ‘Showing Your Best’ through the latest virtual tour software technology through the RTV Virtual Tour system in producing High Dynamic Full Screen virtual tours. The number of technological improvements in just one year keeps us miles ahead of the competition. 2011 is becoming a banner year. One of the latest, but far from being the last technologic breakthroughs is our new mobile internet capability. All apple products, I-phone, I-pad, etc. are now capable of viewing our virtual tours. Have a QR code attached to their sign at the listed house. More and more Realtors are realizing the importance of virtual tours and Digital Marketing. You may have to step out of the box, which can be somewhat scary, but it is either that or get left behind. If you are willing to step out of the box, but are unsure of what to do, call Alamo Area Virtual Tours or go to www.AlamoAreaVirtualTours.com and we will be glad to sit down with you to help you get on the digital freeway so that you will “Let Us Do Our Best To Show Your Best”. Our Success Depends On Your Success!! Time to give credit where credit is due. My company has been working with RTV going on 5 years. I am here to tell you that I could not have wished and received what I have found in working with RTV. It has been like marriage at first site. RTV,s continuing support, constant research, continual updates to their virtual tour software platform,and always upbeat has been and will continue to be very appreciated by myself and my staff. RTV and all their staff have played a large part of the growth of my virtual tour company. Here is a big Thank You for the first 5 years and I have no doubt in 5 years I will writing this again. It’s Summer Time kids and virtual tour orders are coming in left and right. As you know each month we strive to help you become more efficient and better connected to existing and potential customers. Our marketing pieces available to you from www.rockpointemarketing.com are easily customizable and typically just require you to insert your specific company information and logo. 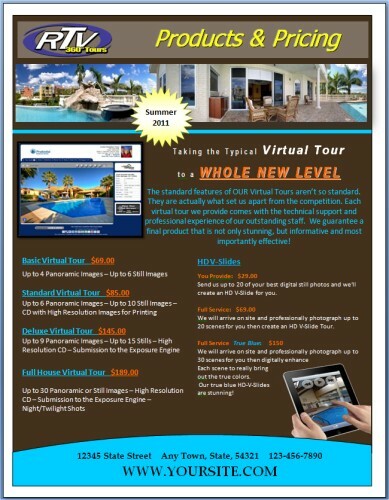 This month’s marketing piece is a SIZZLING two page order form for your virtual tours. This colorful front and back flyer highlights BOTH V-Tours and V-Slides as well as many of your favorite and popular virtual tour add-ons. To customize this piece simply login to your http://www.RockPointeMarketing.com account today, download, set your pricing and you’re ready for print! We recommend using Vistaprint for postcard printing and other printing needs. They seem to have fast service and extremely great rates. Take a moment to read the text through and make sure your company can deliver the services delineated. If you can’t or don’t know how to provide a service such a bird’s eye view shots or nighttime stills, contact us and we can set you in the right direction. 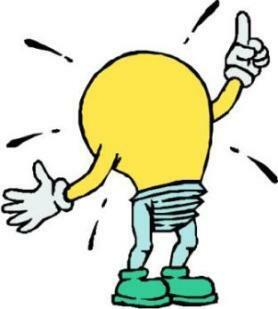 If you have an idea for a piece, suggestions, or want to see something in the next few months send me an e-mail. After ten years of being a professional photographer and owning my own studio, I realized I was ready for a change. I wanted to continue using my degree in photography and my years of experience but I did not want to be tied to a brick and mortar type of business. I realized that virtual tours would be a great opportunity to do that but I also knew I didn’t want to recreate the wheel. I needed a partner who would allow me to do what I do best — take awesome photographs — and not have to spend all my time learning a new business. After more than a year researching virtual tour software technology and about two dozen emails and phone calls with Jason LaVanture, there was no doubt that RTV, Inc was the only choice for me. I am sure Jason had long given up on me by the time I placed my order but not once during that year did he give me anything other than his complete attention when I called with my endless questions. We began our Northern GA virtual tour business while working a full time job but our first big break came from a chance meeting in the grocery store. My wife met the owners of a cabin rental agency in the area where we lived. They had been considering adding virtual tours and we explained that we were willing to give them a super low price if they would let us use them as our guinea pigs. We ended up doing over 40 tours for this company in about six weeks while working my full time job. With that many tours, we learned how awesome RTV technology really is…and at the same time, we earned back our initial investment in the virtual tour technology. Over the next few months in the virtual tour business, we made an effort to do something each day to learn more and build our business and quickly realized that it was time to make the move to doing virtual tours full time. Since the beginning of 2011, we have replaced two full time incomes and shot over 100 virtual tours. Rather than focusing on real estate agents, we have focused on businesses. We have created a niche marketing virtual tours to healthcare, hospitality and education and have had the opportunity to photograph in 26 states in less than six months. Our initial cabin rental company was an opportunity for us to build our portfolio and learn the system so it did not matter that we charged such a low price. That volume in such a short time meant we got to truly test the limits of the RTV technology and perfect our system of shooting and building tours. What it also did was allow us to showcase our work and gave RTV an idea of what we have to offer. When another cabin rental agency in our area called RTV and asked for a photographer to do tours for their 30 cabins, Jacque Burke of RTV called, emailed, texted and sent messages to us on Facebook because she knew we were the perfect fit! We sent samples of our work to the client and the next day began shooting for them. This time around, we shot all 30 virtual tours in less than two weeks in between about 20 other shoots. For anyone considering the virtual tour business, there is no question that RTV virtual tour software company is the partner you want beside you. Let me tell you…The technology is just the beginning. The training is fantastic. Even though I have a degree in photography and have been a professional photographer for 12 years, I learn something new every single time I watch an RTV virtual tour webinar. The technology has grown with us and is always on the cutting edge. We are confident that no one can beat the product we have to offer. Thanks RTV for helping us live our dream!